ACRYLIC, CHARCOAL, PASTEL, RICE PAPER COLLAGE, CONTE CRAYON, PRISMACOLOR PENCIL, AND POLYURETHANE ON COMPOSITION BOARD, 33" BY 25"
This work by Bob is simply amazing. For the past few summers, Bob has visited Anderson Ranch, an artists' community near Aspen, Colorado, to study with and learn from other artists, work on developing new techniques, and paint. This work incorporates more techniques than any work of Bob's I've seen previously... the result is quite impressive. The mountainscape shown in Anderson Ranch is in the Rocky Mountains, probably from the vantage point of the Anderson Ranch itself. Compositionally, this work is very similar to Bob's work Solo Surf Surface... both works include vignettes (the small boxes that depict other scenes) and architectural elements such as lines, circles, and boxes. 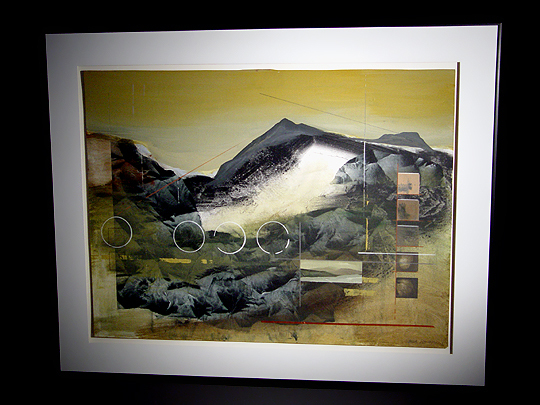 Many of the mountainous areas in this work were made using collage. Unlike most of Bob's other works, Anderson Ranch is very muted... almost the entire work is comprised of earthtones, and there are no hints of blue or green anywhere. Also, the work lacks any of the usual texture that Bob's works contain... he told me that at some point in the process of creating this work, he took a squeegee to the painting and scraped away all of its peaks, rendering the entire work utterly flat. There are a few things about this work that I really love. This is probably the most "realistic" work of Bob's I've ever seen... usually, his landscapes tend to be impressionistic or use extremely vivid colors, but Anderson Ranch comes the closest to photorealism of any of Bob's works that I've seen. I also love all of the architectural elements and vignettes that are scattered throughout the work... I don't know why they work, but they really enhance the overall impression generated by the painting. This work has a sort of (and I hate to resort to cliché, but here goes) je ne sais quoi that I really like. This work was entered in the art show at the 2002 North Carolina State Fair in Raleigh, where it won the award for Best Painting by a professional artist. I'm very pleased to have this work in my collection.